Starting today, the Rashtriya Swayamsevak Sangh (RSS) cadre will don dark brown trousers, doing away with the khaki shorts which was a part of their uniform for 90 years. 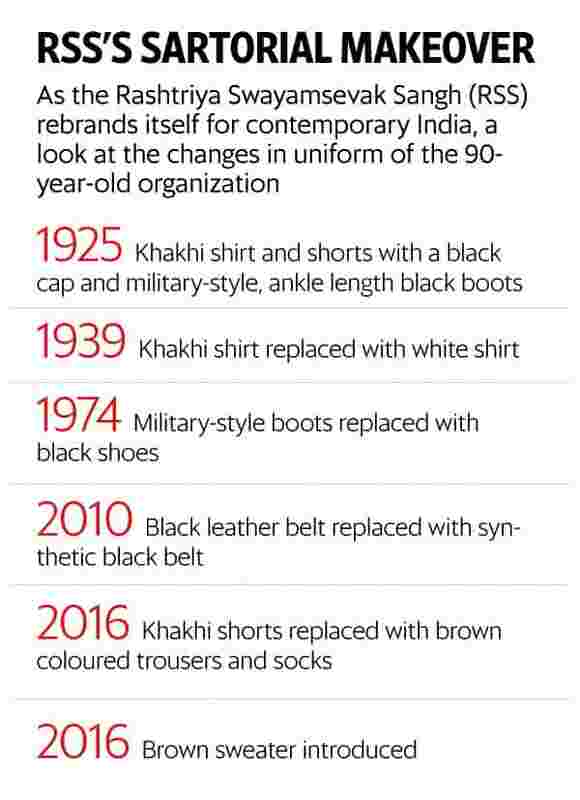 The sartorial transition marks an end to an era in the RSS whose members have for decades been identified with the khaki shorts, inspired by the uniform worn by the British constabulary. The Sangh, which is the ideological parent of the ruling Bharatiya Janata Party (BJP), has also approved change in the colour of socks to be worn by its volunteers, replacing the old khaki with dark brown, to go with the brown trousers they would now wear, with a white shirt and black cap. The traditional bamboo stick remains a part of the uniform. The move comes into effect on Dussehra, also the RSS’s foundation day.